Practices for the “swift, direct path” of Tibetan Buddhism’s pinnacle teaching, Dzogchen. One moment of total awareness is one moment of perfect enlightenment. This is the ultimate insight of Dzogchen, or the Great Perfection, the pinnacle teaching of Tibetan Buddhism. With his previous bestselling books, including Awakening the Buddha Within, American-born Tibetan Buddhist teacher Lama Surya Das has taught millions about the innate wakefulness and liberation that can be our natural ways of being. Now, with Natural Radiance, he offers his first complete daily practice program for the personal experience of the “swift and direct path” of Dzogchen. Dzogchen affirms that we are all buddhas by nature—infinitely open, luminous, compassionate, wise, and free. This profound realization, say the teachings, cannot be understood intellectually or studied mentally, but it can be passed from teacher to student through the spoken word. 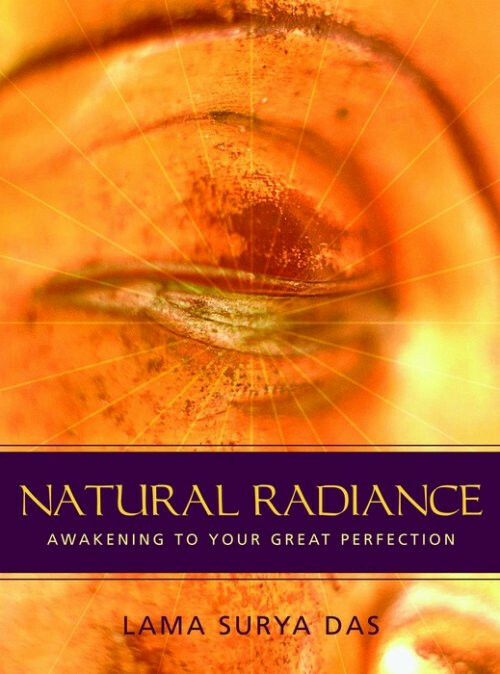 With Natural Radiance, it is now possible to learn these time–honored practices as they have been shared for centuries—through direct transmission from an accomplished master of the tradition. Join Lama Surya Das as your trusted guide to help you awaken to the sky-like nature of mind—what is known in Tibetan as rigpa, or total and pure presence. “This is the time of Dzogchen,” says Lama Surya Das, “when we most need this immediate teaching of the inherent perfection of being … the natural state of enlightenment.” Includes seven guided Dzogchen techniques. And a Lama, a teacher who has the art of making such profound teaching accessible to all levels of understanding.